Domesday records a church and a priest here in the possession of the Bishop of Lincoln; one Nigel ‘the Bishop’s man’ is also recorded as having 2½ ploughs. The Lisures family played a prominent role in the history of the church from an early date and in 1287 Nigel de Lysours presented the first named rector of Fledborough, Hugh de Normanton. At the 1291 taxation the church was valued at £12 6s 8d. A chantry chapel was established in 1343 by Sir John Lyseus. In 1602 the tower was repaired, and in 1636 the sum of £70 was expended on general church repairs. In 1718 yet more work was underway, and the churchwardens were evidently unhappy with affairs, stating that: ‘the part church which is to be repaired by the Duke of Kingston is part done and would have been finished sooner if the workman had not deceived His Grace's steward who made a very firm bargain to have it done long before this time’. In 1587 the churchwardens had complained that their parson ‘was aged and not able to serve the cure’. By 1721 things had changed radically as the Reverend William Sweetapple, then the rector and surrogate, achieved considerable notoriety for conducting a string of ‘runaway’ marriages, up until his death in August 1753 – he had already carried out 44 marriages that year! The church comprises a nave and south porch, north and south aisles, chancel, and west tower. The site of the former chantry chapel to the south of the chancel, demolished in 1764, is evident from the blocked arch in the east wall of the south aisle. The earliest fabric belongs to the lowest stage of the tower which dates from the 12th century; the upper stage is clearly Early English work. The nave and aisles date from the 13th century with later additions including a 14th century clerestory; the chancel was virtually rebuilt in 1890. There are various important monuments including a foliated cross slab of the 13th century and two figurative slabs of 14th century date, one holding a heart. There is a considerable amount of 14th century glass and two fragments, which are internationally important, dating from the 12th century. There are two panels of a 14th century Easter Sepulchre in the chancel. The huge ladder to the upper parts of the tower appears to be medieval, and there are two bells dated to c1350-70 and 1600 set within an Elphick ‘V’ form frame, unusually having curved braces. 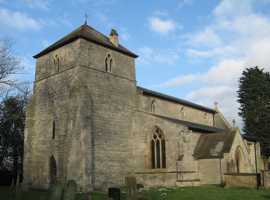 Fledborough church is now redundant and was vested in the care of the Churches Conservation Trust in 1991.